Wynton Marsalis announces that he will play at the 12th annual Dave Brubeck Festival. Wynton Marsalis, a jazz ambassador in Dave Brubeck's tradition and his Jazz at Lincoln Center Orchestra perform Friday at the Bob Hope Theatre, during the Brubeck Festival. Wynton stated ,"His musical contributions will live on as fervently as his commitment to civil rights. He was a true international ambassador who brought people together through jazz." "We were so happy to ... talk to Dave about the festival two weeks before his death," said Marsalis, who participates in a discussion with Pacific's Powell Scholars on Friday. "I was glad he actually had a chance to sit up and listen. ... His son said, 'Listen, if he didn't like it, he would have let you know.' "
"Dave always recognized his immense talent when he (Marsalis) was a kid," Chris Brubeck said. "He's a very talented, bright guy. Dave's career was a kind of template for what to do as an ambassador of jazz. One foot in the classical world. One in the jazz world. He's one of the few who can do both in the way Dave did it." When Wynton steps on stage with his 15-piece band Friday night at the Bob Hope Theatre, you can expect fond words about Dave Brubeck. 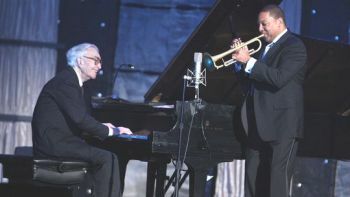 In 2010, the two men performed together at the Newport Jazz Festival. That's when Marsalis called Brubeck "the very essence of what is American greatness." "I think it's appropriate that Wynton should be here at the first festival post Dave's passing," says the Director of the Brubeck Institute and producer of the festival Simon Rowe. "Wynton is a very similar figure to Dave in the way that he has affected the world, the way that he uses the art form as a platform for discussion of important social issues, cultural issues."